Own “King Arthur: Legend of the Sword” on Ultra HD Blu-ray, 3D Blu-ray, Blu-ray and DVD on August 8 or Own It Early on Digital on July 25! 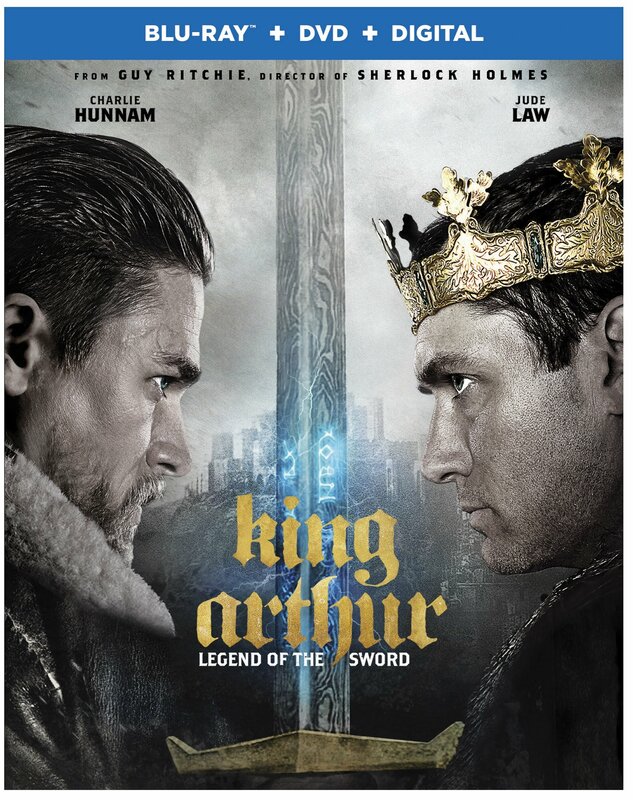 Burbank, CA, June 26, 2017 – Don’t miss the royal showdown when “King Arthur: Legend of the Sword” arrives onto Blu-ray Combo Pack, DVD and Digital. Acclaimed filmmaker Guy Ritchie brings his dynamic style to the epic fantasy action adventure “King Arthur: Legend of the Sword.” Starring Charlie Hunnam in the title role, the film is an iconoclastic take on the classic Excalibur myth, tracing Arthur’s journey from the streets to the throne. From Warner Bros. Pictures and Village Roadshow Entertainment, “King Arthur: Legend of the Sword” stars Hunnam (FX’s “Sons of Anarchy”) and Oscar® nominee Law (“Cold Mountain,” “The Talented Mr. Ripley”), along with Astrid Bergès-Frisbey (“Pirates of the Caribbean: On Stranger Tides”) as Mage; Oscar nominee Djimon Hounsou (“Blood Diamond,” “In America”) as Bedivere; Aidan Gillen (HBO’s “Game of Thrones”) as Goosefat Bill; and Eric Bana (“Star Trek”) as Arthur’s father, King Uther Pendragon. Guy Ritchie (“The Man from U.N.C.L.E.,” the “Sherlock Holmes” films) directed the film from a screenplay by Joby Harold (“Awake”) and Guy Ritchie & Lionel Wigram, story by David Dobkin (“The Judge”) and Joby Harold. The film is produced by Oscar winner Akiva Goldsman (“A Beautiful Mind,” “I Am Legend”), Joby Harold, Tory Tunnell (“Awake,” “Holy Rollers”), and “The Man from U.N.C.L.E.” and “Sherlock Holmes” producers Steve Clark-Hall, Guy Ritchie and Lionel Wigram. David Dobkin and Bruce Berman are executive producers. “King Arthur: Legend of the Sword” will be available on Ultra HD Blu-ray for $44.95, Blu-ray 3D Combo Pack for $44.95, Blu-ray Combo Pack for $35.99 and DVD for $28.98. The Ultra HD Blu-ray features an Ultra HD Blu-ray disc with the theatrical version in 4K with HDR and a Blu-ray disc also featuring the theatrical version. The Blu-ray 3D Combo Pack features the theatrical version of the film in 3D hi-definition and hi-definition; the Blu-ray Combo Pack features the theatrical version of the film in hi-definition on Blu-ray; and the DVD features the theatrical version in standard definition. The Ultra HD Blu-ray, Blu-ray 3D Combo Pack and Blu-ray Combo Pack include a digital version of the movie with UltraViolet. Fans can also own “King Arthur: Legend of the Sword” via purchase from digital retailers beginning July 25th. Additionally, all of the special features, including interviews with filmmakers, new original shorts, featurettes, and deleted scenes, can be experienced in an entirely new, dynamic and immersive manner on tablets and mobile phones using the Warner Bros. Movies All Access App, available for both iOS and Android devices. When a Combo Pack is purchased and the digital movie is redeemed, or the digital movie is purchased from an UltraViolet retailer, the Warner Bros. Movies All Access App allows users to watch the movie and simultaneously experience synchronized content related to any scene, simply by rotating their device. Synchronized content is presented on the same screen while the movie is playing, thus enabling users to quickly learn more about any scene, such as actor biographies, scene locations, fun trivia, or image galleries. Also, users can share movie clips with friends on social media and experience other immersive content. The Movies All Access app is available for download on the iTunes App Store and Google Play Store. The Blu-ray discs of “King Arthur: Legend of the Sword” will feature a Dolby Atmos® soundtrack remixed specifically for the home theater environment to place and move audio anywhere in the room, including overhead. To experience Dolby Atmos at home, a Dolby Atmos enabled AV receiver and additional speakers are required, or a Dolby Atmos enabled sound bar; however, Dolby Atmos soundtracks are also fully backward compatible with traditional audio configurations and legacy home entertainment equipment. Arthur with Swagger – Charlie Hunnam is a gentleman, a hunk and a rebel, setting new standards as king and new rules with the ladies. Sword from the Stone – Director Guy Ritchie as he breathes 21st Century life and luster into England’s most iconic legend and he creates Camelot for a new audience! Parry and Bleed – Charlie Hunnam and other cast members get a crash course in swordplay. Vikings versus Saxons style! Building on the Past – Londinium comes to life with a new design of Medieval Urban life, built from scratch. Camelot in 93 Days – Friendships and romances strengthen and fray as the realities of a 93 day shoot set in. Legend of Excalibur – The world’s most famous sword is brought to life for a new generation. Scenic Scotland – Wrapping a monumental production on location in glorious Scotland. Arthur with Swagger – Charlie Hunnam is a gentleman, a hunk and a badass, setting new standards as king and new rules with the ladies. On July 25th, “King Arthur: Legend of the Sword” will be available to own for streaming and download to watch anywhere in high definition and standard definition on favorite devices from select digital retailers including Amazon, CinemaNow, FandangoNow, iTunes, PlayStation, Vudu, Xbox and others. On August 8th, “King Arthur: Legend of the Sword” will be made available digitally on Video On Demand services from cable and satellite providers, and on select gaming consoles.